In this lesson, we will learn how to interpret the variation in data by learning about sample and population standard deviation. What is the denominator in the calculation of population standard deviation for a data set with 𝑛 items? What is the denominator in the calculation of sample standard deviation for a data set with 𝑛 items? Calculate, to the nearest hundredth, the sample standard deviation for each of the shown data sets. Which of these statements helps explain the large difference between the sample standard deviations for the two data sets? AThe single large value of 51 in data set 1 causes the standard deviation to increase significantly. BThe mode of data set 1 value of 28 causes the standard deviation to increase significantly. CThe lowest value is in data set 2, so this makes the standard deviation smaller. DThe median of data set 1 is greater, which explains why the standard deviation is greater. EThe mean of data set 1 is greater, which explains why the standard deviation is greater. The data set shown contains a potentially outlying value of 32. What effect would removing this value have on the standard deviation? AThe standard deviation would not change. BThe standard deviation would decrease. CThe standard deviation would increase. Without calculating the exact standard deviations of the following data sets, determine which of them has the lowest standard deviation. 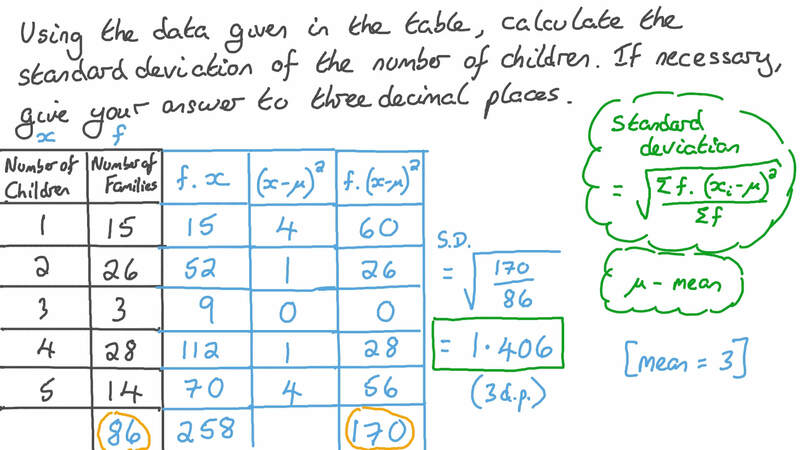 Using the data given in the table, calculate the standard deviation of the number of children. If necessary, give your answer to three decimal places. In general, what does a larger value of σ mean? A The data is more spread out. B The median is larger than the mean. C The data is less spread out. D The mean of the data is smaller. E The mean of the data is larger. Calculate, to the nearest hundredth, the sample standard deviation for each data set. What do these values reveal about the two data sets? AData set 1 is more widely spread than data set 2. BThe distributions of the two data sets are very similar. CData set 2 is more widely spread than data set 1. DData set 2 is more variable than data set 1. EThe spread of the two data sets is very similar. The following data represents the morning temperatures in degrees Fahrenheit and the rainfall in millimeters for all the Canadian cities east of Toronto in July. By considering the standard deviation, determine which data set is more variable. State the standard deviation of this data set to three decimal places. Using the data given in the table, calculate the standard deviation of the ages. Give your answer to three decimal places. Calculate the standard deviation of this frequency distribution of the ages of a group of people. Round your answer to the nearest thousandth. The weights of 175 students are recorded in the frequency table. Calculate the standard deviation, rounding to the nearest thousandth. The given table is the frequency distribution for a number of defective units found in 80 boxes of manufactured units. Find the standard deviation of the number of the defective units, and round the result to the nearest thousandth. 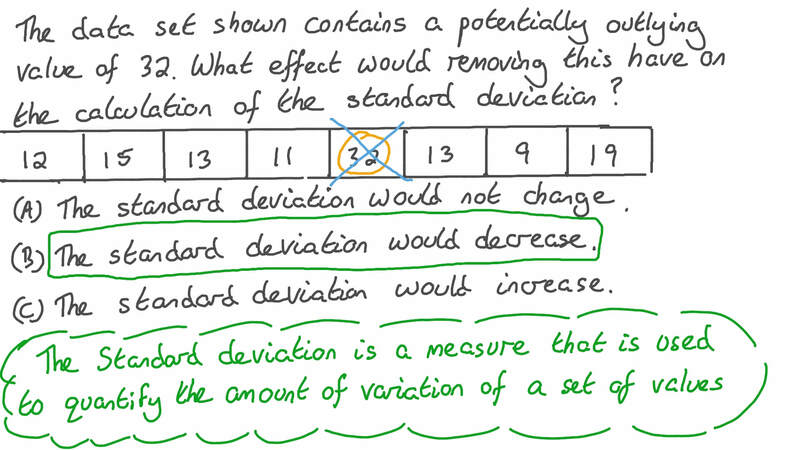 Using the data given in the table, calculate the standard deviation mark. If necessary, give your answer to three decimal places. The marks of 76 students in an exam are recorded in the frequency table. Calculate the standard deviation, rounding the result to the nearest thousandth if necessary. 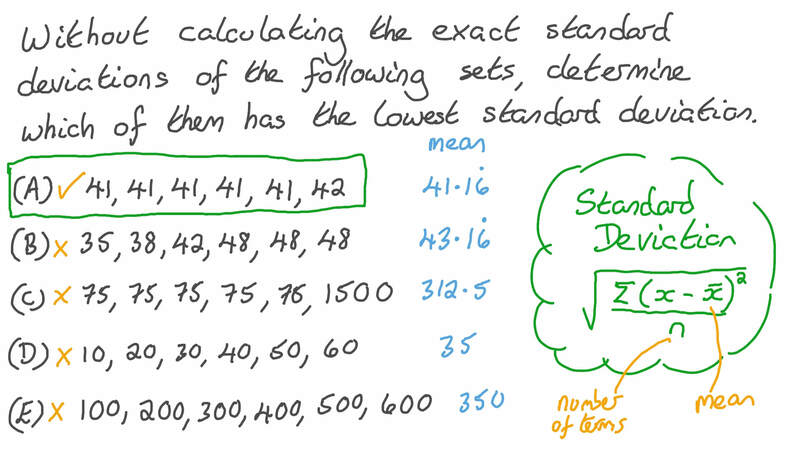 Find, to two decimal places, the standard deviation of the following scores obtained in a quiz by 85 students. Nabil is playing a gambling game where he will either win money, lose money, or break even, as shown in the table. Let be the outcome for this game. Calculate, to the nearest hundredth, the standard deviation of . The table shows the greatest distances thrown by the finalists in the discus competition of the 2016 Rio Olympics for both men and women. Calculate, to the nearest hundredth of a meter, the population standard deviation of the distances thrown by the men and the distances thrown by the women. What is the correct interpretation of the population standard deviations? AThere was a greater variability in the distances thrown by women. CThere was a greater variability in the distances thrown by men. DOn average, women threw farther than men. EOn average, men threw farther than women.